The word out of Hyundai is that the new i10 city car is a step above its predecessor on all kinds of levels. The size, refinement and quality have all been upgraded, yet Hyundai has decided to keep th price point the same as the outgoing model. Pricing starts at just £8,345, with the first deliveries of the new vehicle arriving at the end of January, 2014. 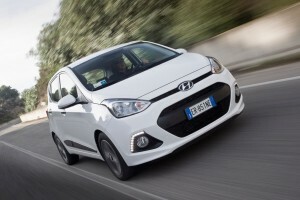 As well as having a 10% increase in luggage space, the all-new Hyundai i10 is also 80mm longer, 65mm wider and 50mm lower than the previous model. There are a pair of petrol engines to choose from. The base model is the ‘S,’ which comes with central locking, tilt adjust steering wheel, daytime running lights, 14-inch wheels, and CD tuner + USB as standard. Moving up to the SE trim adds standard features such as electric heated side mirrors, remote central locking, electric rear windows, driver’s seat height adjustment, body color door handles and a black B pillar. The top of the line Premium trim comes with LED daytime running lights, 14-inch alloy wheels, Emergency Stop Signal, Bluetooth connectivity with voice recognition, front fog lamps, steering wheel controls, door mirror indicators and a drivers safety window. It also comes standard with chrome effect interior door handle and parking brake, side body mouldings and a leather steering wheel and gear stick. The base engine is a 1.0-liter 3-cylinder that delivers 65hp and takes the car from 0-62mph in 14.9 seconds, with a top speed of 96mph. The 1.2-liter inline-4 delivers 86hp and goes from 0-62mph in 12.3 seconds and a top speed of 106mph.